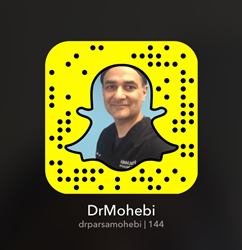 Dr. Parsa Mohebi was recently named one of the top doctors to follow on Snapchat by U.S. News & World Report. Dr. Parsa Mohebi, the Los Angeles based founder of Parsa Mohebi Hair Restoration, was recently named one of the top doctors on Snapchat. The list of doctors to follow, to learn more about plastic surgery and other medical procedures, was published in July by U.S. News & World Report.